Transform your photos and videos into stunning movies. Corel VideoStudio Pro 2018 expands it's award-winning combination of ease of use and breakthrough creativity with fun new features to help you tell your story. Tap into hundreds of creative effects, create elegant titles, show multiple videos simultaneously and more! Turn your memories into movies with VideoStudio Pro 2018. Easy and Intuitive - Perfect for all skill levels, learn as you edit and create impressive videos right from the start. Uniquely Creative - Choose from 1,500+ filters and effects, enjoy multi-camera editing, play with speed, and more! Award Winning - VideoStudio is widely recognized for being easy and packed with features. Supports Popular Formats - Edit HD, 4K, and even 360 videos to create great-looking movies. Flexible and Fun - Start with templates or edit on the Timeline and combine photos, videos, and audio on multiple tracks. From users to reviewers, everyone is talking about how many features we've packed into VideoStudio Pro 2018. VideoStudio looks better than ever with a new, intuitive user interface that makes it faster and easier to edit your videos. Quickly crop video, resize, and position your media directly in the preview pane. Show multiple video streams simultaneously with new Split Screen video templates. Easily drag and drop to create impressive promotional videos or share the highlights from your latest trip! Looking to do even more? Create your own custom split screen layouts with the Template Creator in VideoStudio Ultimate. Quickly remove distortion from wide angle cameras or action cameras with new and intuitive controls to make this easy, freeing you up to focus on the fun parts of video editing. Plug in your camera and capture your animation frame by frame. Now with support for all popular Canon and Nikon cameras and enhanced controls to help you capture your stop motion animation perfectly. Zoom in on the action, or pan across a scene with new controls. Apply visual pan and zoom effects to your video across custom motion paths with easy to use controls. Simply import your 360° footage and start editing! With expanded support for popular 360 degree cameras, export your 360 video directly to YouTube, your VR headset, and more! VideoStudio continues to support the latest file formats and associated peripherals. Now adding XAVC-S authoring to SD card, so you can export your video for playback directly on your camera. VideoStudio is optimized for the latest video hardware acceleration technologies from Intel and nVidia, which improves efficiencies and dramatically speeds up rendering to popular file formats. Tell your story from multiple angles. Easily combine, sync, and edit footage from multiple cameras and select the angle you want to show as your video plays. Combine up to 4 camera angles with VideoStudio Pro and up to 6 angles with VideoStudio Ultimate. Plug in your camera and create a stop motion animation, frame by frame. Now with expanded support for Canon and Nikon cameras, auto capture settings, and new grid tools to help make it easy to make controlled motions. Easily adjust the opacity of your tracks directly in the timeline to show multiple clips at once. Create custom fade in, fade out, or superimposed effects. The creative possibilities are unlimited with this fun effect. Create and customize the movement of graphics, titles, and more along a defined path. It’s the perfect way to introduce or emphasize elements in your video. Get the right look with hundreds of drag-and-drop effects, animated titles, and transitions. Create picture-in-picture effects, overlays, and more video effects and filters! Track an object and add moving text, graphics, or blur faces, logos or license plates in your video with accurate Motion Tracking tools. Adjust how overlay objects blend with the background with the Green Screen effect. Use a video mask, set transparent color, and easily swap out backgrounds and add fun effects. Removw the distortion or fisheye effect captured by wide angle or action cameras. Start with presets for GoPro cameras and then fine-tune adjustments with correction tools. Play with speed with Time Remapping and easily add slow motion or high-speed effects, freeze the action, or reverse and replay scenes. Dive into hands-on editing and edit virtually any type of media. Import your video from cameras or mobile devices, and edit freely in VideoStudio. Enjoy a smooth and fast editing experience when working with large, high resolution video files. Smart Proxy creates low res working files to edit with, then reverts to the original high-res files when you render out your video. Access royalty-free soundtracks in the ScoreFitter music library. Easily add them to your timeline and have them automatically adjust to the length of your movie. Crop and resize your media directly in the preview window. Make quick edits, create picture in pictures, or straighten your media in a few easy clicks. Adjust the height of each track to maximize your editing space and focus on the details to trim or edit videos. Even mute the entire track in a single click. Now you’re in control of the icons you display in the middle toolbar. Customize your workspace and set quick access points to the tools you use most. View the library, preview pane, and editor mode simultaneously with new dual window controls. Even detach windows to work seamlessly across multiple screens. Export your video for playback directly on your camera with new XAVC-s authoring to SD card support. Preview the effects as you adjust the transparency. In this version, Track Transparency is easier to access and make fine adjustments. New scalable windows allow you to work freely in a larger space. Expand the Customize Motion window and get closer to your edits with a full screen view. Get started quickly with the intuitive editing workspace. Create your videos and combine photos and videos in Storyboard or Timeline editing modes. Add subtitles, graphic overlays and more! Start from scratch or drag and drop your media into a range of customizable templates to match your style. Even save your own projects as templates to fast-track future projects. Add filters and enhance color, or create that old film effect with drag and drop filters. Fine-tune adjustments in the options panel to get the exact look you want. Go full circle with the full suite of 360 degree video editing tools to trim, enhance, add titles or graphics and edit your 360 video. Even preview your 360 video in the new VideoStudio 360 video player before you export. Import your video and start editing! Now with support for all popular 360 cameras. VideoStudio supports 360 spherical video formats - equirectangular, fisheye, and dual fisheye. Set the viewing angle and convert 360 video to standard video for playback on TVs and standard video players. You control the view the audience sees. Export your video to view on your VR headset or 360 player. Even upload your 360 video directly to YouTube, Facebook, or Vimeo 360. Upload your video to YouTube, Facebook, Vimeo and Flickr directly from VideoStudio. Author DVDs complete with themed templates to add chapters and menus. Now add chapter cues directly in the VideoStudio timeline as you edit! Share movies anywhere with full support for Apple and Android devices, game consoles, and more. Now with support for exporting vertical/portrait video. Record your screen and capture system and microphone audio to create training videos, content for presentations, and more. Make movies and slideshows in 3 easy steps. Select a template, add your media, and export to share your movie. Burn your video projects to DVD and AVCHD with 100+ customizable menus, submenus, chapters, and music. For beginner editors to advanced users, get the most out of VideoStudio with new learning content from both Corel, and our friends at StudioBacklot.tv. 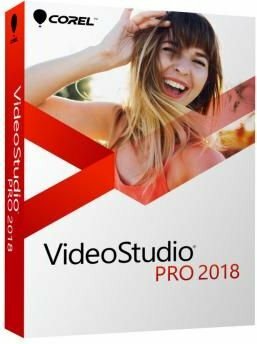 Includes new content for VideoStudio 2018. Expand the power of your video editing software and purchase additional premium effects, templates, overlays, royalty-free music, and more from within the VideoStudio Home tab. Record multi-camera videos with MultiCam Capture™ or import multi-layer graphics from PaintShop Pro®. Give your old videos new life with Roxio® Easy VHS to DVD. There’s no limit to what you can create with Corel!